In all baking, a scale is the simplest and easiest way to be sure that you are using the same amount of the ingredient as the person who created the recipes. 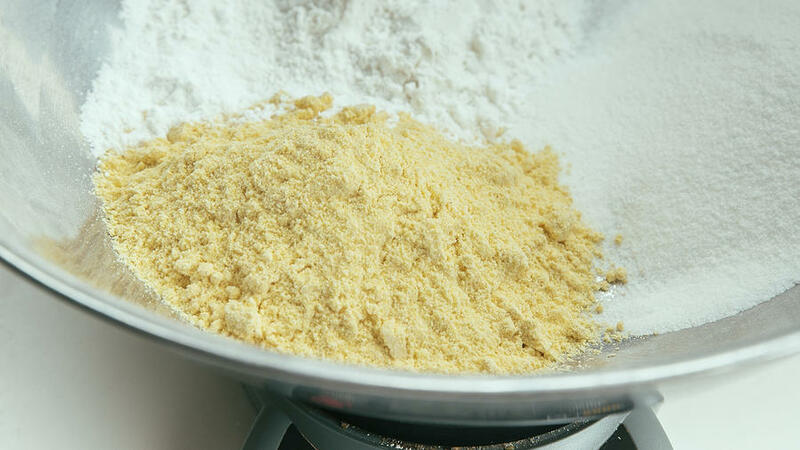 Flour is one of the trickiest of all ingredients to measure. For one thing, measuring styles vary. A cup of any single flour can vary in weight by as much as 50 percent depending on how the cook used the cup: Did she dip the measuring cup into a compacted bag of flour and press it against the side of the bag to level it (please, please never measure this way! ), or dip it into a canister of loosened flour, or spoon the flour lightly into the cup and then sweep it level? Each method affects how much flour ends up in the cup. In addition, flour that is compacted in a bag will weigh more per cup than flour that has been stirred of fluffed or even just handled before measuring. But if we all use a scale, your 100 grams of flour is the same quantity as my 100 grams of flour. To make matters even more interesting, weight and volume are not the same for all flours. A cup of corn flour does not weigh the same as a cup of rice flour or a cup of chestnut flour. Even more startling, there is no standard fineness for the same flour from different mills: so even the same type of flour may not weigh the same per cup from one brand to another. The only way to deal with this chaos is to measure by weight. Fortunately, once you get the hang of it, a scale is the simplest and cleanest way to measure. Fewer utensils are required, so there is less cleanup. There are other advantages, too. Say a recipe calls for 100 grams of chopped nuts or ground nuts; all you have to do is weigh the nuts first (no matter what size they are to start with), then chop or grind them, instead of chopping or grinding a little at a time until your measuring cup is filled, and then usually having some extra left over. With a scale you can often weigh ingredients one by one, directly into the mixing bowl; just press the tare to reset the scale to zero after each ingredient is added before weighing the next. Blissfully easy! What kind to buy: A battery-powered digital scale is most efficient; choose one that will switch between ounces (imperial) and grams (metric), ideally with increments of 5 (or fewer) grams or one-tenth of an ounce.